There isn’t a condiment I love more than ketchup, and it’s not just because it somehow manages to make French fries even better than they inherently are. Ketchup’s culinary potential spans far beyond potato dipping and spreading on burgers. This versatile ingredient is basically a sweeter and more syrupy tomato paste that can add an amazing level of depth to anything from stir-fry recipes to essential sauces. Here are some of the most important places where ketchup belongs in your life. A ketchup and honey sauce is the perfect savory-sweet combo to slather over grilled chicken legs. Heck, you’ll want to generously baste the kitchen with this sauce. You might as well go ahead and make a double batch… trust me, you’ll “need” it. Leftover shredded chicken serves as the foundation for these delicious open-faced sandwiches dressed with a ketchup-based barbecue sauce. Spoon sauce over Texas toast slices and serve with our easy, creamy slaw. Here, chicken is tossed in a flavorful ketchup and Worcestershire mixture (plus a handful of other necessary seasonings) for an over-the-top BBQ pizza, ready in only 9 minutes. Seems like a good night for a DIY pizza dinner, right? Did someone say portion-control? Meat loaf that you can bake into muffin cups are not only stinking cute and convenient, but these personal loaves help keep your serving sizes in check. You only need 15 minutes of hands-on prep time and 1 hour of baking for this sirloin meat loaf. For even cooking, use a loaf pan as a mold to shape the meat loaf; then invert onto the baking sheet. If you’re looking to get more grains in your life, this is 45-minute recipe should be a new go-to in the dinner rotation. Quinoa and vegetables bulk up meat loaf to a hefty, nutrient-dense portion. Bonus points: You can freeze leftovers for up to 2 months. The secret is in the [cocktail] sauce. Ketchup, horseradish, lemon juice, and soy sauce create a deliciously pungent and bright sauce that perfectly complements boiled shrimp. To round out the meal, pair this dish with boiled fresh corn on the cob and baby red potatoes. 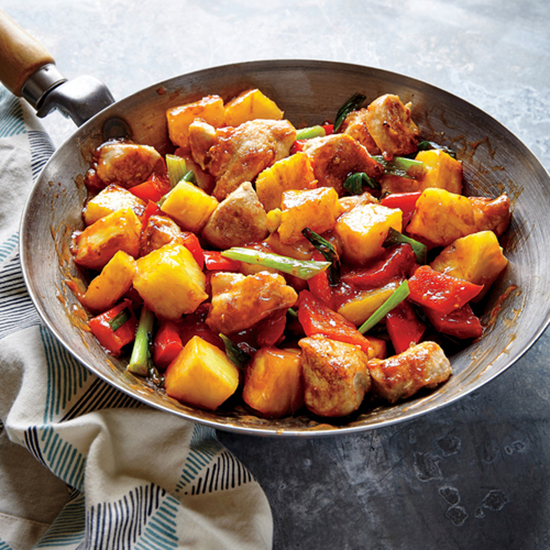 Simmering chicken and bell peppers with a delicious ketchup mixture makes for irresistible Sweet and Sour Chicken. Our take saves 446 calories and 1,260 milligrams of sodium over one serving of a leading chain’s version. Can’t beat that. You’re 23 minutes from stir-fried perfection. Sriracha adds spice and powdered peanut butter adds richness to this sweet-and-spicy ketchup sauce. Vegetarians can get in on this stir-fry action, too. Take note, this dish errs on the spicy side; to make it extra kid-friendly, omit the chiles from the sweet and sour sauce. This is without-a-doubt Nana’s traditional baked beans recipe. With just 5 ingredients and an instruction list of only 5 sentences, these sweet baked beans couldn’t be easier (or more comforting). Beans, lentils, and a ketchup mixture are slow-cooked to rich and savory perfection in this global mash-up of a summer classic.